Rodelle Inc. was founded on a relentless commitment to high-quality specialty food products. When the Rodelle family moved to Denver, Colorado, from the south of France in 1936, they quickly realized their new country lacked a high-quality pure vanilla extract for their recipes. So the family of avid bakers decided to produce their own premium vanilla extract and founded Rodelle Laboratories in 1936 to revolutionize the standard for gourmet flavors. In today’s connected world, people want to know much more about the food they buy and consume than they have in the past. We appreciate and embrace their desire for information. 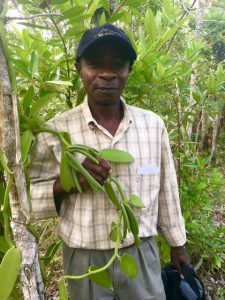 Testament to our commitment to transparency are our direct relationships with vanilla farmers through the farmer’s co-op SAHANALA, and streamlined supply chain. Click here to read more about how Rodelle supports growing a middle class in Madagascar through the Rodelle Foundation. At Rodelle Inc., we understand that competition is fierce in the industries we serve, which is why we’re dedicated to innovation. Rodelle's R&D team works hard to keep ahead of the flavor trends that impact each industry so that we’ll always have the products you need, when you need them. From concept to completed product, we can help with flavor and recipe development, assisting with trained taste panels who know how to distinguish the “that’s good” flavors from the “oh wow, can I have another bite?” option. And we’re able (and willing) to fine-tune formulas until the finished product is just right. Pairing the art of taste development with the science of vanilla extraction, we mix time-honored, traditional curing practices with state-of-the-art extraction equipment and facilities. And we rely on a tenured team of professional chemists and microbiologists to help us ensure the quality of the materials that enter and leave our facilities. Rodelle R&D experts have worked on a range of products, from liquid flavors to instant sauces, seasoning blends, and everything in-between, which gives us a wealth of experience to draw on when you need a new flavor, a precise match to an existing one, or even some in-the-trenches problem solving. At the end of the day, we believe that providing superior ingredients and products begins in the field with the grower. The success of the business depends on developing productive relationships with suppliers and farmers, who then provide the exceptional ingredients that make Rodelle products unique. This is why each year, Rodelle contributes to projects that protect the environment and promote social and economic development in key growing regions. To date, our efforts have included providing sustainable practices, improving water sanitation, and raising standards of living. Our commitment to relationships and sustainability also applies at home: Built green and wind-powered, the Rodelle facility is proud to recycle 75 percent of the waste we produce, allowing us to make a sizable positive impact with an environmentally friendly footprint.